His reading of the Hebrew text raises questions about when the concept of a resurrected messiah first emerged. 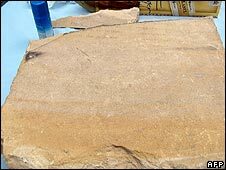 Questions remain over the tablet's precise origins, however, and some scholars doubt its authenticity. The tablet, known as Gabriel's Vision of Revelations, is believed to date from the first century BC. It is believed to have originated from the Jordanian, east bank of the Dead Sea. It was discovered 10 years ago and now belongs to a collector living in Zurich, David Jeselsohn, who acquired it in Jordan. The tablet is a metre (three feet) tall with 87 lines of Hebrew in two columns. Unusually, the text is written onto the tablet, rather than engraved. Some letters, and entire words, on the tablet are illegible. Israel Knohl argues that his interpretation of the Hebrew text could "overturn the vision we have of the historic personality of Jesus". 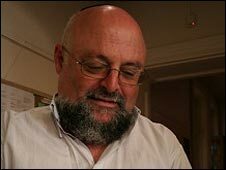 "This text could be the missing link between Judaism and Christianity in so far as it roots the Christian belief in the resurrection of the Messiah in Jewish tradition," he told the AFP news agency. According to Professor Knohl's interpretation, the key line of the text quotes the Archangel Gabriel telling a "Prince of Princes" that "In three days you shall live: I Gabriel command you." Professor Knohl argues that other lines on the tablet refer to blood and slaughter as ways to achieve righteousness, which he places in the context of a Jewish revolt against the Romans. He argues that the tablet refers specifically to the resurrection of a Jewish leader at the time. The professor's theory is not unchallenged. With much of the text missing, debate on the overall meaning of the text on the tablet rages. Ada Yardeni, a specialist in ancient languages at the Hebrew University who has studied the tablet in question, does not agree with Professor Knohl's conclusions - but acknowledges that the key word in the quotation could mean "live", despite being spelt unusually.